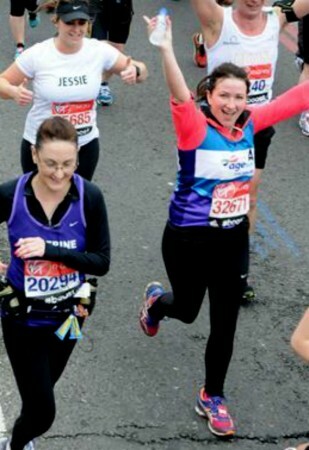 Amy (right) en route in the London Marathon. 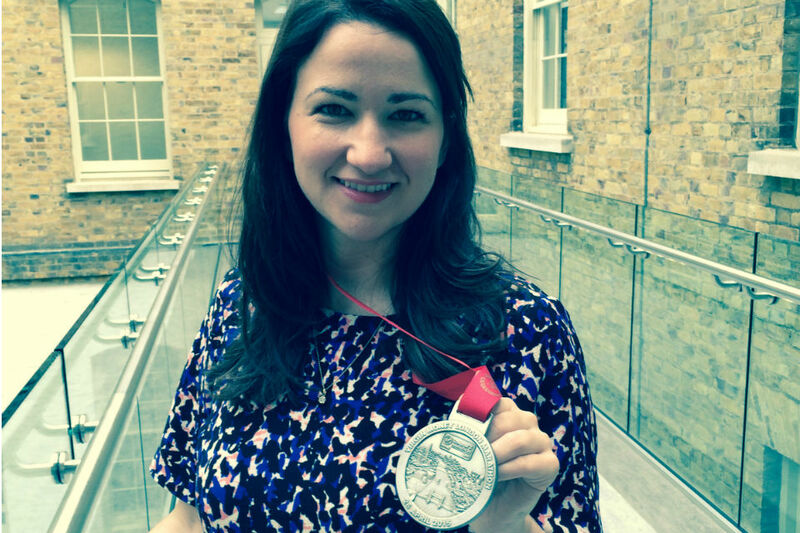 Last month, I ran the London Marathon on behalf of Age UK, joining over 38,000 other elite, club and fun runners. The previous year I had watched the whole day and was inspired. I had run five half-marathons in Berlin, New York, Edinburgh, Henley and Richmond. It felt like a good time to take the next step, as it were, and I needed a new challenge. I ran in memory of my late grandparents, and for my other granny, who is waging a dignified battle with dementia. It’s comforting to know that Age UK is there as a cushion to help all our elderly loved ones. Age UK is the country’s largest charity dedicated to helping everyone make the most of later life. They provide services and support at a national and local level to inspire, enable and support older people. These include a befriending network, financial advice, health and social care services and help for people looking to stay in their home longer. They are also a fantastic campaigning organisation, tackling pensioner poverty and ageism, among other things. My aim in running the marathon was to raise £2,000 for this marvellous charity. I began in earnest. I decided joining a running club was the best way to make the training fun and effective. I soon realised it was also a great way to meet new people and connect with friends and colleagues in a different way. Believe it or not, I really enjoyed the training, running three times a week, with a long run at the weekends, and increasing the mileage by 2 miles every weekend. It did start to get really tough at about 16 miles, though, and the last few weeks before starting to reduce the mileage before the big day (tapering, as it’s known in long-distance-running circles) were not fun. The fundraising was amazing. I organised a very well received bake sale in 70 Whitehall and ran a sweepstake with a colleague who was entering the London Marathon for St John Ambulance. The generosity of civil servants was really outstanding. Lots of people donated who didn’t know me but connected with the charity and wanted to give in memory of their parents or grandparents. My favourite parts of the actual day were all the children with their hands out waiting to high five the runners, the bizarrely ambitious fancy dress costumes, the cheering crowds and the extraordinary number of messages of support I had from friends and family. Having thought I would be pleased just to get round, I got quite competitive in my training, doing my 20-mile run in 3 hours 18 minutes. However, I underestimated the challenge at hand. Like anything, you learn so much when you try something for the first time. No matter how much advice you get, it doesn’t compare to experiencing it and realising what you did well, what you could improve on and what were genuine mistakes. Small mistakes cost minutes and it was also very painful. Ignorance is definitely bliss with your first marathon. The commitment needed to stick to the training schedule through important social occasions and any injuries needed steely determination. I also found that during my training runs, keeping a positive mental attitude and believing I could do it made a difference of a minute or two per mile, or 10% to 20% in my case, something I really think equates to a working environment. And knowing what you want out of it is certainly the most important first step, whether it’s raising lots of money for charity, getting fit or beating your personal best. Will I do it again? At the 22-mile mark I promised myself I wouldn't! But now I know how I could easily improve my time, it’s just so tempting! Not for a year or so, perhaps… or at least the summer! Although this race is over, there’s still time to donate and all the money goes to the amazing Age UK.